La Belle de la Riviere Bed and Breakfast is located in Newaygo, Michigan, nearby the Muskegon River in Central West Michigan. This bed and breakfast is nestled in the downtown Newaygo Shopping District. During your Bed and Breakfast stay you will have access to river sports, antique shops, and beautiful Michigan foliage. We send a special thanks to innkeepers Robin and Esther for answering this informative interview on a Bed and Breakfast stay at La Belle de la Riviere. Foliage.org: Give our readers a brief history of La Belle de la Riviere and of your experience as an innkeeper. Built during the lumber boom in 1871, the Riblet house was at the height of architectural design. The home survived the Newaygo Fire of 1873. S. K. Riblet was instrumental in prospering the town of Newaygo by helping to bring the main travel route for parts north through Newaygo. During the lumber boom Newaygo was a prime location on the Muskegon River for advancing the lumber industry. Today, Newaygo remains a quaint little town with big character. The Muskegon River is noted for steelhead, trout, walleye, salmon, and catfish. The area is also an adventure destination for outdoor enthusiasts and has played host to the 2011 National Canoe & Kayak Races on the Muskegon River. For a relaxing vacation the Newaygo area is a perfect hideaway from the big city rush. Located midway between Chicago, IL and Traverse City, MI, on M-37. 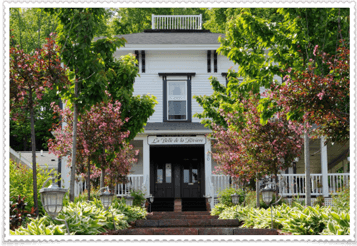 Is your inn a member of any Bed and Breakfast associations? A member of the Michigan Lake to Lake Association and Bed and Breakfast.com. What have guests said they most enjoyed about their stay at La Belle de la Riviere? The hospitality of the innkeepers, the delicious breakfasts, the comfortable beds, and the beautiful views. What is your B&B’s favorite destination for local Michigan foliage trips? What are other popular Newaygo, Michigan tourist attractions? Name your favorite local pubs, diners, or restaurants and what you like about each. The Sportsman’s Bar Grilled Prime Rib and Thursday nights AUCE Shrimp. Smugglers Cove Restaurant on the lake great food & fun. Jimmie’s Road House Sports Bar succulent ribs. City Limits diner wonderful home cooked food. What local attractions does your boutique bed and breakfast recommend for evening entertainment? Dogwood Center for Preforming Arts in Fremont has weekly entertainment. The River Stop Saloon has some weekend entertainment. There is Fremont Cinemas movie theater ,Fremont Lanes and Summer Breeze Par 3 Golf, the Wessling Observatory in Newaygo, or playing games, cozying up to a warm fire at the inn. Our website newaygobb.com highlights our community and surrounding areas so there is always something to do close by. Does La Belle de la Riviere specialize in certain B&B food? We have been told that we have the best breakfast bacon around. We usually have desserts like Rum Cake or No-Bake Cookies along with coffee & tea in the afternoon. If your Bed and Breakfast is fully booked, what other inn would you recommend? We are the premier Bed & Breakfast for this area and the only one in Newaygo. There are other rental establishments along the main travel route. Do you offer bed and breakfast deals during the fall foliage season? What else would like to tell our readers about a bed and breakfast stay at La Belle de la Riviere? At LaBelle de la Riviere “Your comfort is our concern.” If there is any special accommodations, dietary restrictions, or other areas of concern we are very adept at getting our customers what they need for an absolutely memorable stay. Check out our reviews under the reviews tab at newaygobb.com or on bedandbreakfast.com. When you stay at LaBelle de la Riviere we treat you with the respect and regard that we appreciate when we are traveling. Come check us out…the coffee’s on! Special thanks to Robin and Esther of La Belle de la Riviere for granting us this interview with their Michigan, Bed and Breakfast.